Earned an amazing eight NCAA All-America honors for her singles and doubles play...won the NCAA doubles championship in 1986 with teammate and 1999 UMSHoF inductee Lise Gregory, as they finished the year undefeated at 29-0...together, the tandem compiled an impressive 84-10 record over three years...was consistently ranked among the nation's top five singles and doubles players during her years at UM...hired as the Head Women's Tennis Coach at Florida International in 1997, after serving as an assistant from 1995-97...attended Miami Sunset High in Miami, FL. UPDATE: Ronni is currently serving as the Head Women's Tennis at the University of Michigan. 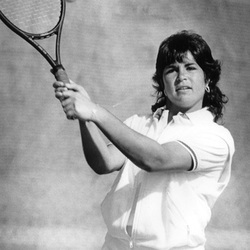 Bernstein was a four-time ITA All-American in both singles and doubles during her illustrious collegiate career at the University of Miami (Fla.) from 1984-88. She was named the NCAA Senior Player of the Year in 1988 after reaching the finals in doubles and semifinals in singles at the national tournament. As a sophomore in 1985-86, Bernstein (then Reis) teamed with Lise Gregory to win both the ITA National Intercollegiate Indoor and NCAA doubles titles en route to finishing the year with an undefeated record of 29-0. Bernstein compiled impressive career marks of 103-21 (.831) in singles (second all-time at Miami) and 89-11 (.890) in doubles (eighth all-time) while helping the Hurricanes consistently finish among the top five of the national rankings. Miami put together a combined record of 85-23 during Bernstein's career, earning a runner-up finish at the 1985 NCAA Championship before making a semifinal appearance at the national tournament in 1986. Among her other credits, Bernstein claimed the doubles gold medal at the 1985 Pan American Games, the doubles bronze medal at the 1986 Goodwill Games and she was a triple gold medalist at the 1985 Maccabiah Games. She was also named by Tennis Magazine as a member of its Collegiate All-Star team in 1986, '87 and '88 and was selected to the USTA Federation Cup team those same years. In 2000, Bernstein was inducted into the University of Miami Sports Hall of Fame. After receiving her bachelor's degree in business management from Miami in 1988, Bernstein played professionally on the WTA Tour for two years, achieving career-high world rankings of No. 30 in doubles and No. 78 in singles in 1989. That same year, she was named Rookie of the Year and Player of the Year for Domino's Team Tennis. Bernstein was also a two-time Virginia Slims of Puerto Rico doubles champion (1987, '89), a Virginia Slims of Aptos, Calif., doubles champion (1988) and a Virginia Slims of Wichita, Kan., singles semifinalist (1989) during her pro career. Bernstein captured the 1984 Florida state singles championship as a senior at Miami Sunset Senior High School. She was also the 1984 USTA Florida State Closed singles champion and was ranked No. 1 in the state during her last year of juniors.